San Marino has chosen Serhat to represent them at the 2019 Eurovision Song Contest. In Russia, Sergey Lazarev’s possible return is hot topic. This year’s Eurovision could offer comeback from at least two people. What are the odds that they will do well? We are still waiting for the confirmation from Russia on whether or not the rumours about Sergey holds any truth, but today, San Marino gave us the first comeback artist this year, as they presented Serhat as their 2019 act. The 54 year old Turkish singer took part for the country in 2016. With the song I Didn’t Know, he failed to reach the final. His song for the contest in Tel Aviv, Israel this May is not revealed yet, so we can’t predict based on that how he will do in this Eurovision return. Last year we looked at past winners of the contest who returned and how they scored coming back. Now we have compiled a list of some notable Eurovision competitors who participated in the contest more than once (without winning on first attempt) and whether they achieved better success in their comeback. 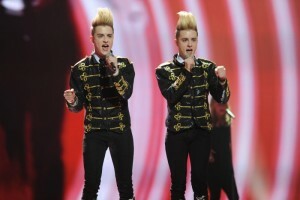 Irish twins Jedward represented their home nation two years in a row. Like some of the other artists who have represented their country on more than one occasion, their first attempt was the most successful. In Düsseldorf, the twins finished in 8th place with their song Lipstick. The following year in Baku the boys returned with Waterline but finished in 19th place. Sir Cliff’s first attempt at the contest was in 1968. His song Congratulations! was a huge hit with fans. but shockingly he lost out to Spain. Cliff returned to the contest in 1973 and finished third. Valentina Monetta is the only Eurovision competitor to enter the contest on four consecutive times in a row. Representing San Marino, Valentina failed to qualify for the Grand Final in her first two attempts (2012 & 2013) but became Sammarinese hero when she qualified in 2014. She returned again in 2017 but again failed to qualify for the grand final. Sakis represented Greece at the contest on two occasions. In 2004 he finished in 3rd place with the hit Shake It. He returned 5 years later, in 2009, with This is our night. Unfortunately for Sakis, he failed to better the success of his first attempt and finished in 7th place. Bulgarian Poli Genova managed to score higher on her second attempt. In 2011, she competed against Jedward in Düsseldorf with her song Na Inat. She didn’t qualify for the final and returned five years later with English language song If Love Was A Crime where she finished in 4th place. At the time, this was Bulgaria’s highest ever scoring until Kristian Kostov came in 2nd place the following year. If Sergey does indeed return to the contest he will he hoping to follow in Dima Bilan’s footsteps. In 2006 the Russian star finished in 2nd place with Never Let You Go. Two years later he returned and went on to win the contest with his song Believe giving Russia their first ever win at the contest.